Kala has taken their expertise in engineering and technology found in their award-winning laminators and have created the industry's finest flatbed mounting table. This table is the ideal solution for mounting, 1-off laminating and applying pre-mask. located on both sides of the machine. No need for compressed air. 3 levels setting of pressure - low, medium and high- guarantee to reproduce the same job quality every day according to the media, without guessing on the pressure. A safety laser sensor that detects the media or any obstacle and slows down before touching the substrate. 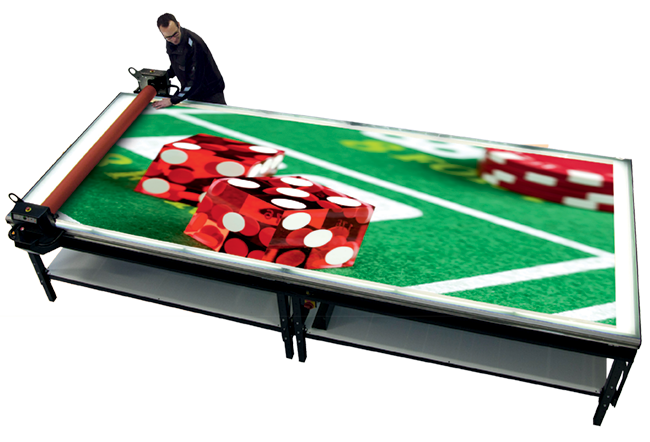 The roller lands smoothly on the surface, including the most fragile materials like foam board. With its unique pressure adjustment system, the roller stays parallel to the working surface. Unlike systems using a compressor, your operator can work on the side of the table, even with smaller width boards. There is no need to position smaller boards to the center. the roller down. Adjustments can also be done while moving the carriage. Material unwind linked to the roller with additional storage of rolls at both ends of the table. operation and less wasted media. A PVC cutting mat covers the entire surface of the table, which is antistatic and phthalate free. Table edge rails include a cutting guide to quickly cut media with a regular knife. Advanced LED lighting system for a large and improved visibility range with a low energy consumption. Unlike other flatbed applicators on the market, you can take advantage of the square footage beneath the AppliKator table and use it to store medias or any material used daily in a printer workshop. Size of table is customizable based on your needs and available space. An anti-static, phthalate-free, PVC cutting mat covers the entire surface of the table. Posted in the categories Filter by Equipment / Displays / Accessories, Filter by Brand.